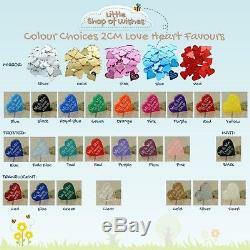 Personalised Love Heart Table Sprinkles Confetti Wedding Favours Small 2cm Hearts. Personally laser cut just for you from 3mm acrylic with the Title and Surname (or two first names) and the date you require. Ideal for: Wedding Favours, Table Decorations, Venue Decor, Anniversary Parties, Christening, Baby Shower, Naming Day, Birthday or any occasion. Colours: Choose from - Silver, Gold, Red, Pink, Royal Blue, Purple, Teal, Blue, Black, Plum, Orange, Yellow, Clear, Pale Blue, Pearl or Green. Material: 3mm acrylic in either - Mirror Acrylic, Frosted Acrylic, Metallic Acrylic, Translucent Acrylic, Clear Acrylic, Pearlescent Acrylic or Glossy Acrylic. How to personalise this item. Taking care to type the details correctly as we will copy and paste the details exactly as you type them and once manufactured, mistakes cannot be rectified. B - each heart will have the same personalsation details. To send the message during checkout. Type the details required in the message box. What can be personalised on the item? Line 1: Max 12 characters i. E Mr & Mrs, Mr & Mr, Mrs & Mrs, Name 1. Line 2: Max 12 characters i.
E Surname, Name 2, Occasion such as Birthday / Christening. Line 1: Max 8 characters i. E 30.06.19 / 2019. The date will always be in the format of dd. Yy so if you give is a date 15th June 2019 we will produce them with 15.06.19. We can do double barrelled names but they would be split over two lines and would not include the date. The two name version can be used for other occasions with details such as "Alice's Christening 25.09.19". All pack sizes are available in all "type" combinations (Mr & Mrs, Mr & Mr, Mrs & Mrs and Double Name). If you would like to order a "type" and "pack size" combination that is not available in the drop down, please use the double name variation and specify the title when sending the personalisation details, this can also be used for "Dr & Dr" etc. If you would like anything else changing, please have a look around our shop. To see if there is a more suitable item, if you can't find what you are looking for, please do not hesitate to send us a message and we will do our best to produce what you require. Caution Choking Hazard - These 2cm heart are small and must be kept away from young children, they are not sweets. Also known as Perspex it is a hard plastic. Like-for-like, it is very similar to the qualities found in glass however it is less than half the weight of glass. Although acrylic will not splinter like glass these items are delicate and should be handled with care. Glossy Acrylic - Is a solid coloured acrylic and has a gloss finish on both sides. Frosted Acrylic - Is a translucent acrylic with a coloured tint all the way through and a matt finish on both sides. Translucent Acrylic - Is a translucent acrylic with a coloured tint all the way through and a glossy finish on both sides. Pearlescent Acrylic - Is a solid acrylic with a glossy and slightly sparkly surface. Metallic Acrylic - Is a solid acrylic with a glossy finish on both sides. Mirror Acrylic - is very similar to the reflective qualities found in standard glass mirror, highly reflected on one side and matt grey on the other. Is a translucent acrylic with a glossy finish on both sides. 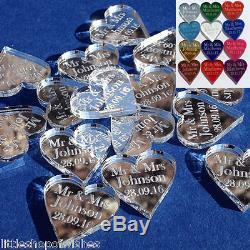 All hearts are printed in white ink on the front of the hearts, mirror acrylic hearts are etched. PLEASE NOTE: Our printed hearts are delicate decorative items, if they are handled without care then the printed text may rub off. These come ready to use, no peeling required and are supplied in an organza bag to keep them safe until the big day. Please note sample packs (4 hearts) are not supplied with an organza gift bag - they are supplied flat on a removable glue dot. 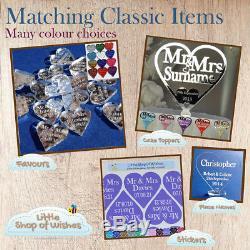 Please note, this item is personalised and produced to order so is not returnable. In the unlikely event it arrives damaged, please send us a picture of the damage, including the packaging within 24hrs of receipt and we will be more than happy to send a replacement. 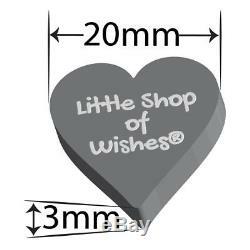 "Little Shop of Wishes ®" is a Registered Trade Mark of Twiddleys Ltd. Personalised Wedding Favours Mr and Mrs Love Heart Confetti Decorations. Heart Sizes: each heart measures. 20mm x 20mm x 3mm. Beautiful keepsake for any occasion. Designed and Manufactured by us in the UK. 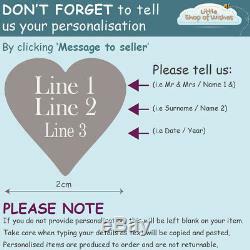 The item "Personalised Wedding Love Hearts Mr & Mrs Table Confetti Decorations Mini Favour" is in sale since Friday, August 25, 2017. This item is in the category "Home, Furniture & DIY\Wedding Supplies\Centerpieces & Table Decor". 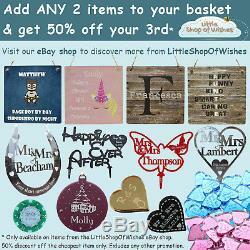 The seller is "littleshopofwishes" and is located in Llanelli, Carmarthenshire. This item can be shipped to United Kingdom, Ireland, Australia, United States.